Claiming to be the world's first artificial intelligence (AI) park, Beijing's Haidian Park has opened with smart exercise runways, augmented reality tai chi and driverless shuttle buses. Waiting for the bus on Monday, a visitor told the Global Times she heard about the park on TV. 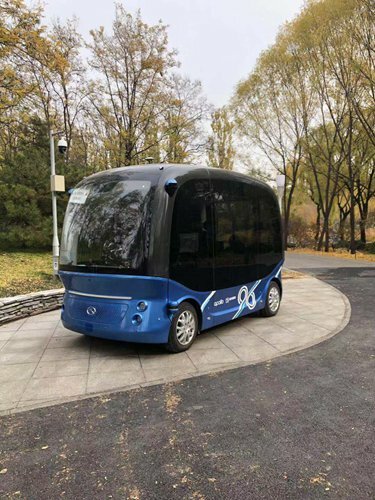 "I think it is so interesting to experience the new driverless vehicle in the park and so do many of my friends," said a middle-aged woman surnamed Wang Fang. Visitors must register for the driveless shuttle bus which runs eight times a day on a trial basis. The blue bus accommodates six to seven passengers. There is no traditional driving system, but a smart screen shows progress along the route, the Global Times found. It was "convenient and environment-friendly" and also "smooth while running," the passenger told the Global Times afterwards. A smart speaker has been installed in Chenglu Pavilion that responds to visitor instructions, including questions about weather and traffic. A smart runway has three posts that recognize faces and records body data including heartbeat and pulse. "Everyone can AI," Pei Haodong, a spokesperson for search engine giant Baidu, which helped build the park, told the Global Times on Monday. Baidu wants the park to serve as a role model for other urban parks and bring AI closer to everyday life, Pei said. More than 10,000 people have visited the park over five days, according to Baidu. Haidian district government and Baidu signed an agreement in January to jointly explore a "smart city" building, the Xinhua News Agency reported on Monday.